The Juno spacecraft passes in front of Jupiter in this artist's depiction. When NASA's Juno spacecraft launches toward the planet Jupiter on Friday (Aug. 5), it will be only the second mission ever dedicated to studying the largest planet in our solar system. If all goes well, the probe should beam back the best photos ever taken of the gas giant planet, NASA says. The Juno probe is on track to blast off from Florida at 11:34 a.m. EDT (1534 GMT) on Friday, then spend five years sailing across the solar system to reach Jupiter. 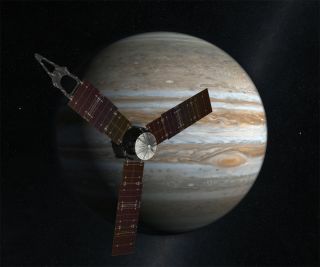 Bolton credited Galileo, a NASA spacecraft that visited Jupiter in 1995, and other robotic spacecraft that have flown by the planet for laying down the groundwork that makes Juno's quest possible. "It's the next step. All of the questions that we've had answered by the previous explorations have honed our knowledge and let us focus in on the questions that remain," Bolton said. Juno will spend about five years traveling to Jupiter, and will enter orbit around the planet on July 4, 2016. The probe is equipped with various instruments to analyze the planet's atmosphere, gravitational field and magnetic field. Juno will circle Jupiter in a polar orbit that allows it to scan almost the entire surface of the planet over time. Juno is slated to lift off on a United Launch Alliance Atlas 5 rocket on Friday from Florida's Cape Canaveral Air Force Station. Weather forecasts predict a 70 percent chance of favorable conditions for the launch, said Captain Billy Whisel of the U.S. Air Force's 45th Weather Squadron, which monitors weather conditions for NASA launches at Cape Canaveral. "We only expect a 30 percent chance for any weather violations," Whisel said. "The primary concern is the cumulous cloud rule," he said, explaining that the rocket cannot lift off in certain cloud conditions. Launch managers are also eyeing Tropical Storm Emily, which is currently around the Dominican Republic, but could threaten the launch area with winds and rain later in the week. NASA must decide whether or not to roll out the Atlas 5 carrying the Juno spacecraft from its preparation facility to the launch pad early on Friday morning. Managers will consider whether the storm looks likely to roll in if for some reason the vehicle can't launch on Friday and will be stuck out at the pad. "We don’t want to leave the vehicle and spacecraft exposed to the winds and the rain," NASA launch director Omar Baez said. "So we're looking to be able to see how far out we can predict what may or may not happen." In addition to its special scientific potential, the Juno mission is special in other ways. For one, it is the first spacecraft to travel such a long distance propelled by solar energy, rather than nuclear power, which has been the norm. For example, the distance from the Earth to the sun is a trip of 93 million miles (150 million km), a distance astronomers call 1 astronomical unit (AU). Juno will be about five times as far when it is at Jupiter. "It is an exciting development that we can actually go all the way out to 5 AUs with solar power," said Colleen Hartman, assistant associate administrator at the Science Mission Directorate at NASA Headquarters in Washington, D.C. "It really is the advance in technology." And the spacecraft is carrying a special camera dedicated to education and public outreach. Its images will be released to the public, including students and amateur astronomers, for processing and study. "This camera's purpose is to give the general public the chance to see what it's like to be a participant in a space mission," said Candy Hansen, Juno co-investigator at the Planetary Science Institute in Tucson, Ariz. Finally, Juno will be carrying a few special mementos to honor its legacy. A plaque honoring the 17th century Italian astronomer Galileo Galilei, who was the first to sight the four largest moons of Jupiter, will be flying aboard the spacecraft. So will three small LEGO figurines representing Galileo, as well as the Roman god Jupiter (known in Greek as Zeus) and his wife Juno (Hera in Greek mythology). "We hope that will increase the awareness of children about the space program," principal investigator Bolton said. "This will also help them to understand both the mythological studies that went on, and also the contributions that Galileo made. I think it fits with everything were doing."